Easy to prepare and tasty dessert/cake. I got the recipe from here. Preheat the oven to 190 degree celcius/ 375 F.
Mix the rava with sugar and baking powder in a bowl. Add the melted butter and mix well. Add the mango pulp, mix well and keep aside for 10 minutes. Add the prepared batter to greased ramekins or baking pan. Place it in the oven and bake for 25-35 minutes or until a knife or fork inserted comes out clean. Don't keep it for longer time, it will become hard.. I like your star mold. Cake looks delicious. The star shapes are giving an attractive look to the dessert.. semolina and mango combo sounds interesting. Mango semolina cake looks Awesome !! I love the idea of using rava and minimal ingredients to bake such a lovey cake. thats awesome.. I love your start shape cake.. looks delicious. Hi Shabbu, I want you to collect an award from my blog, which I had given to all my friends earlier..and now giving to my new friends..
You will find it on the side bar of my blog in the labels..the first one. or go through this link below. This is awesome. 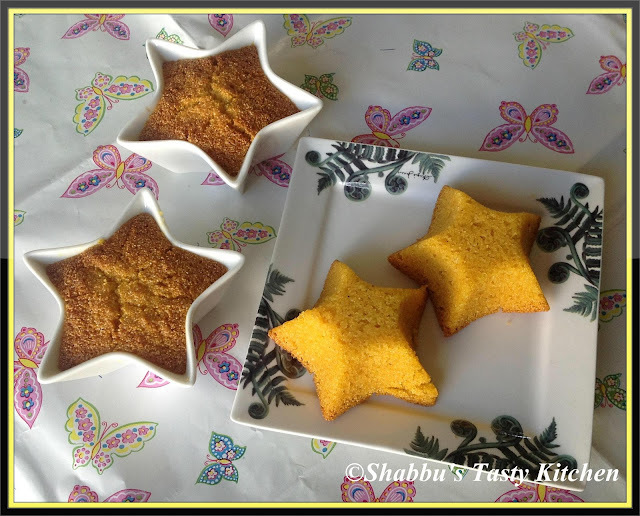 Just four ingredients super easy n quick... love your star shaped mould. What a super easy cake...love the star shapes!!! Nice star shaped cake! Great! 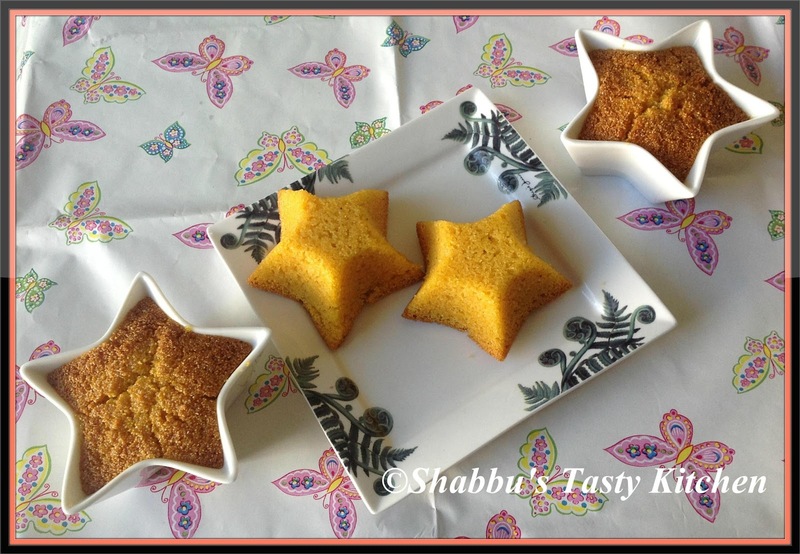 Cute star shaped cake & great flavors,I too have a mango cake in my drafts ..will post soon!! Cute n yummy cake, looks so nice. These are the cutest things I have seen all day! I love it! You can make pulp out of fresh mango, by removing the flesh of the mango and puree it. Adjust the sugar as required. We do not get fresh mango in NZ, so I have not tried using the fresh mango.